Join Washington Revels & Carpe Diem Arts as we conclude the art service project we began on Martin Luther King, Jr. Day. 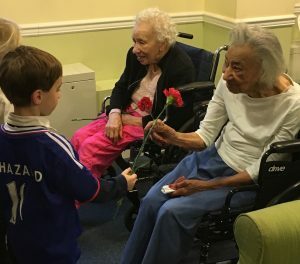 We will visit Springvale Terrace Senior Living Community and Shepherd’s Table in Silver Spring to share fellowship with the homeless and the elderly and to deliver the beautiful Valentine’s Day Cards we made in January. Please RSVP in advance by email to Jo Rasi (see below) and please make and bring more cards from home. Can’t join us to hand out cards but want to contribute? We need even more lovely valentines! Contact Jo Rasi for more information on how you can help.